The above line is often attributed to Confucius; I read it in a fortune cookie once. It is such simple logic, but often we become so wrapped up in the obstacles that impede the journey that we become mired in fear of failure and stand still, stuck in our own misgivings. I've been thinking about how important it is to take that single step as I've been reading reactions to the Senate vote to proceed with debate on the Senate's version of the health care reform bill. I've had misgivings about both the House and Senate bills; I don't think that either of them goes far enough in making the substantive changes that are needed to provide affordable health care to everyone. However, I think that the passage of the House's bill, and the Senate's vote to move to debate and avoid a Republican fueled filibuster are steps forward on what may prove to be a long journey to health care reform on a grand scale. My friend Beth (Nutwood Junction) observed in a Facebook comment that if health care reform legislation is defeated, it will be perceived as a failure of the Obama administration. I agree, if this reform of health care fails, then everything that Obama attempts after this is likely to be met with such resistance that it fails. A victory, even a flawed one, will give impetus to future change and there is so much more to be done. So although neither of the health care reform bills goes as far as is needed for real reform, I believe that the hybrid of the two that is likely to be passed (today I'm an optimist) will move the debate forward, laying a foundation for additional reform in the future. I don't think that I'm dreaming. I was born in 1955, one year after the U.S. Supreme Court declared in Brown v. the Topeka Board of Education that separate but equal was inherently unequal. Yet, I grew up under segregation. The south didn't rush to take down the "colored not allowed" or "white only" signs. I attended segregated schools until I was in tenth grade (1971). It took a seemingly endless stream of legislation to bring to fruition the promise of the Brown decisions of 1954 & 1955: the Civil Rights Acts of 1957, 1960, 1964, 1968, 1991, and the 1965 Voting Rights Act. The journey towards a health care system that serves the needs of all of the people, that doesn't deny access to health care to the people, and is not motivated by profit margins, is a good thousand miles, maybe more. However, I do believe that a win now will lead to additional changes until we get it right. I've seen it happen before; I have lived change that once seemed impossible. All we have to do is to take the first step. President Obama has already begun the journey; all that we must do is have a little faith and travel with him. It's always satisfying to have your work recognized and I am very grateful to Gerry, Daughters of the Shadow Men, for selecting me as one of her recipients of the Kreative Blogger Award. I recommend that you check out Gerry's blog and experience her creative spirit. As a recipient of the Kreative Blogger Award, I'm supposed to reveal seven things about me that you don't know. Having been a blogger for three years, I'm not certain if I have any unrevealed bits of me, but I'll try. 1. Several years ago, when I was still teaching high school English, I literally ran into Maya Angelou. I had joined my friend HR in going to a performance by Ms. Angelou of her poetry. As we were leaving, HR and I were separated in the exiting crowd and I took a shortcut to the car that necessitated walking past the stage exit door. Hurrying along, I nearly bumped into a tall, imposing woman who was coming out of that exit. Looking up, I came face to face with Maya Angelou. I muttered, "Excuse me." She replied, "That's all right, dear." Feeling that I needed to say more, I added, "I'm a teacher." Without missing a beat, she patted me on the cheek and said, "That's nice, dear." I didn't think that the poem was particularly good, but Atwood liked it. I've been writing poetry ever since. 3. I met James Dickey, the author of Deliverance when I was a junior in high school. Calvin Atwood, the poet-in-residence, was friends with James Dickey, who was speaking at the local college, Atlantic Christian College (now known as Barton College). Atwood and Mr. M, the English Coordinator for Wilson County, invited me to accompany them to hear Dickey speak. After Dickey's presentation, they invited me to come back to Mr. M.'s apartment. I was starry eyed, and particularly enchanted by the jacket which Dickey wore. It had been worn by Burt Reynolds in the film, Deliverance. 4. I can play the guitar. When I was 14, guitar masses became popular in progressive Catholic churches. Sister Mary gave me my first guitar, a six string steel guitar. I taught myself to play it. It was the height of the civil rights movement and the peace not war ideology of the 1960s. For mass we played guitar and sang Kumbaya, Blowin' in the Wind, and We Shall Overcome. My favorite song had the lyrics, "Hear O Lord, the sound of my call; Hear O Lord, and have mercy; My soul is longing for the glory of you; O hear O Lord and answer me." I no longer own a guitar but I've decided to buy one, soon. 5. I can tie a knot in a cherry stem using only my teeth and tongue. I discovered my talent when I was in college. 7. My favorite flavor of ice cream is vanilla. I'm particularly fond of Ben and Jerry's French Vanilla. I don't like plain chocolate ice cream. I like chocolate fudge ice cream mixed with other flavors, but not straight run of the mill chocolate ice cream. I think that I'm supposed to pass this award along to a few other bloggers. However, I think that I will pass on doing so. I like so many blogs; each offers something unique and I just can't settle on who deserves an award. So consider yourself awarded for your creativity and copy the Kreative Blogger icon to add to your blog. Then tell us a few new things about yourself. In the end, we are all deserving of appreciation for our creative efforts. It's always something. The U.S. Senate is making it perfectly clear that it has no intention of accepting the baton when it comes to running with health care reform. The primary Senate objection is to the government health insurance plan in the House bill passed on this past Saturday. The party affiliation shape shifter Sen. Joe Lieberman (Independent) has declared , "... as a matter of conscience, I will not allow this bill to come to a final vote." South Carolina's Sen. Lindsey Graham (R) has proclaimed, "The House bill is dead on arrival in the Senate." In addition, a few moderate Democrats said to hold the power in the Senate, are opposed to the government health insurance plan included in the House bill. The power in the hands of the few moderate Democrats is the power to stop a Republican led filibuster. Senate Majority Leader Harry Reid (D) needs 60 votes to start debate and 60 votes to end discussion and call the bill to a final vote. Those few moderate Democrats' votes are very important in the scheme of things. The primary opposition to the government plan is that it puts the government into competition with private insurers. I feel as if I've missed something. Haven't the conservatives supported capitalism and its system of free market enterprise with cries of competition is good? Lieberman asserts that his opposition to a public option arises from his belief that it could be a huge and costly entitlement program. Entitlement is a big buzz word, implying that a slew of undeserving persons will benefit from the public option. How do you deserve medical care? How can you be undeserving of medical care? In one of the most affluent nations in the world, how can it possibly be acceptable that some people don't receive health care because of exorbitant costs for medical care and/or health insurance? I smell more compromise in the air. Already, Republican Sen. Olympia Snowe of Maine, who voted for a version of the Senate bill in committee, has provided the Democrats with a fallback position. She's proposing the "trigger" option which would allow a government plan as a last resort, if after a few years premiums keep escalating and local health insurance markets remain in the grip of a few big companies. Frankly, I think that the trigger has already been pulled, over and over again. Exactly how costly do premiums have to get and how extensive does the monopoly of the health insurance market by a few major players have to be before the need for a government plan is triggered? The House would require employers to provide coverage; the Senate would not. The House would pay for the coverage expansion by raising taxes on upper-income earners; the Senate would use a variety of taxes and fees, including a levy on high-cost insurance plans. The House plan would cost about $1.2 trillion over 10 years; the Senate version would cost under $900 billion. Sigh, I guess that I need to keep my senators on speed dial. In the words of Yogi Berra, "It ain't over till it's over." My favorite Dickens' novel, A Tale of Two Cities, begins with the line, "It was the best of times; it was the worst of times..." It's a seemingly contradictory statement, but I think that Dickens got it right. Darkness and light, good and evil, joy and sadness, everything comes in pairs. Thus it is that landmark health care legislation passed in the Democratic controlled House on Saturday night, legislation that proposes to provide health care coverage for 96% of Americans; however, women who are receiving a federal subsidy to aid in securing insurance under a private plan will be denied coverage for abortions. 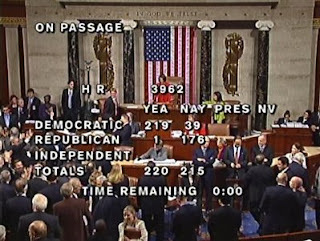 The vote in favor of the health care legislation was close, 220 to 215, with one lone Republican, Rep. Joseph Cao (Louisiana) joining 219 Democrats in favor of the legislation, with 176 Republicans and 39 Democrats opposed. The vote on restricting access to a legal abortion for certain individuals and small groups was passed by a vote of 240 to 194. However, as I read the news about the House vote, I am nonetheless encouraged by the overall victory, even though it was by a slim margin. The House's vote was historic, approving the broadest overhaul of US health care in 50 years and providing President Obama with a significant victory on his top domestic priority. To all the naysayers who said that he couldn't do it, I say a very adult, "Na, na, na, na, na!" I am reminded why I voted for President Obama. He has the patience and tenacity that most of us lack. This was a hard fought battle, not at all an easy victory. The Senate will also be a difficult vote and I expect the victory to be by a narrow margin but I do expect there to be a victory. 8. Creates a federally regulated marketplace where consumers may shop for insurance and allows the government to sell health insurance. My personal favorite is #7. It means that the insurance companies will have to be competitive in attracting consumers. This should make everyone happy who believes in free market enterprise. What's missing from this legislation is a robust public option; what's left of the public option has been watered down considerably. It also does nothing to alter health insurance as a for profit industry. I don't believe that this legislation is what is needed to provided health care to all. My dream is a single payer, not for profit, health care system. In the midst of celebrating this step forward, I wonder if perhaps now is the time to fight for more meaningful reform. However, I can't help but think of the protesters and elected officials shouting about socialism and I wonder if perhaps I expect too much, and that this is an incremental step towards broader reform. The best articulation that I've read on the weakness of the passed legislation is by Rep. Dennis Kucinich, who explains why he didn't vote for the bill. He's either got chutzpah or he's an idealistic dreamer, or maybe he's both. According to news reports, Speaker Nancy Pelosi compared the passage of the health care legislation in the House to the passage of Social Security in 1935 and Medicare 30 years later. This is huge step forward and I like to think that all of our telephone calls and emails made a difference. However, there's no time to rest. The Senate has to pass this legislation before a final version ends up on the President's desk, awaiting his signature. The good news is, you only have two state senators to contact.